Editor’s Note (Oct. 25): Owing to prevailing and expected weather conditions, El Galeón has extended her stay, is not expected to depart before Saturday, Oct. 29 and is available for tours every day,” according to the Village of Greenport. The replica Spanish Galleon El Galeón will be docked in Greenport’s Mitchell Park Marina from Monday, Oct. 17 through Sunday, Oct. 23, offering public self-guided tours every day from 10 a.m. to 6:30 p.m. Visitors will be free to roam above and below the ship’s five decks, talk to the current crew members (real sailors living on board), and absorb dozens of interactive exhibits, videos, historical documents and displays. There is no time limit, and photos are welcome. Tickets are $10 for adults and $5 for children, and are available online here. The ship will be hosting school groups from 3 to 5 p.m. on Wednesday. Greenport residents are invited to tour the ship for free. The 170 foot El Galeón is a replica of a 17th Century Spanish galleon, and its home port is St. Augustine, Florida. She is a replica of the type of vessel used by the Spanish Crown for maritime expeditions from the 16th to 18th centuries, when they were used to discover and establish trade routes between Spain, America and the Philippines. Galleons were armed merchant vessels with tonnages ranging from 500 to 1,200, and their overall lengths would range from 130 to 200 feet. For three centuries, these Spanish galleons criss-crossed the Atlantic Ocean, sailed around the Caribbean Sea and the American coasts, and covered the Pacific route as well. They carried seamen, merchant traders and settlers, as well as large holds filled with products for trade. 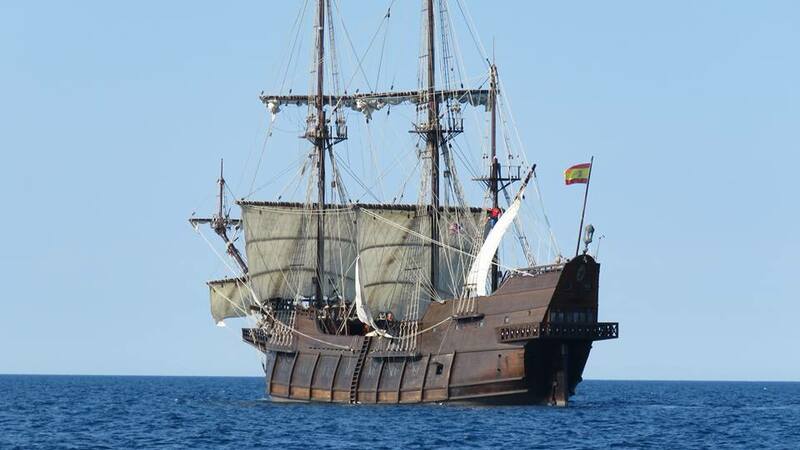 The team that built El Galeón took three years to research historical and maritime archives in Spain to compile information about galleons’ shapes and measurements, followed by six months of design by naval engineer and historian Ignacio Fernandez Vial and 17 months of work by 150 people before she was launched in Punta Umbría (Huelva, Spain) in November of 2009. She is a 500-ton galleon, with an overall length of 160 feet and a beam of 32 feet. Four masts hold six sails which measure a total of almost 11,000 square feet. Her average speed is seven knots. Since launching, a crew between 15 and 35 people has manned her across the seas and oceans around the world. East China seas, the Aegean Sea, the Bosphorus strait and the Caribbean Sea, covering thousands of nautical miles in an attempt to evoke her ancestors’ passages around the world. The Village of Greenport and El Galeón’s owners, Nao Victoria Foundation, have organized this visit to Greenport, with the assistance of the East End Seaport Museum. Incredible that they were actually able to complete the building in less than a year and a half – even with 150 people working, that’s really impressive. Just goes to show how important all the years of research, design, and planning are to such a project. Beautiful piece of work – and happy it’s able to visit Greenport – though sorry I can’t be there to greet her! ‘Tis a mighty proud sight! Thanks for posting this, Beth! We had the honor of boarding El Galeon when it made port in New Bedford, MA, a few months ago. It is a beauty, indeed!! We were visiting as a part of the Rogues Armada (a Pirate recreation and entertainment organization based in Boston). So for one glorious day we greeted visitors, and took our own “tour” of the ship, with our trusty photographer in tow. I would love to share pix here! The Greenport event is not one to be missed. Stepping on board transports you back in time and makes you wonder what it would be like to travel the seas aboard such a beauty…!